Hot galvanized screw pin bow shackles. Bulk packed. Size: 1".. Hot galvanized screw pin bow shackles. Bulk packed. Size: 1-1/4".. Hot galvanized screw pin bow shackles. Bulk packed. Size: 1-1/8".. Hot galvanized screw pin bow shackles. Bulk packed. Size: 1-3/8".. Hot galvanized screw pin bow shackles. Bulk packed. Size: 1/2".. Hot galvanized screw pin bow shackles. Bulk packed. Size: 1/4".. Hot galvanized screw pin bow shackles. Bulk packed. Size: 3/4".. Hot galvanized screw pin bow shackles. Bulk packed. Size: 3/8".. Hot galvanized screw pin bow shackles. Bulk packed. Size: 5/16".. Hot galvanized screw pin bow shackles. Bulk packed. Size: 5/8".. Hot galvanized screw pin bow shackles. Bulk packed. Size: 7/16".. Hot galvanized screw pin bow shackles. Bulk packed. Size: 7/8".. Hot galvanized screw pin "D" shackles. Bulk packed. Size: 1".. Hot galvanized screw pin "D" shackles. Bulk packed. Size: 1-1/4".. Hot galvanized screw pin "D" shackles. Bulk packed. Size: 1-1/8".. Hot galvanized screw pin "D" shackles. Bulk packed. Size: 1-3/8".. Hot galvanized screw pin "D" shackles. Bulk packed. Size: 1/2".. Hot galvanized screw pin "D" shackles. Bulk packed. Size: 1/4".. Hot galvanized screw pin "D" shackles. Bulk packed. Size: 3/4".. Hot galvanized screw pin "D" shackles. Bulk packed. Size: 3/8".. Hot galvanized screw pin "D" shackles. Bulk packed. Size: 5/16".. Hot galvanized screw pin "D" shackles. Bulk packed. Size: 5/8".. Hot galvanized screw pin "D" shackles. Bulk packed. Size: 7/16".. Hot galvanized screw pin "D" shackles. Bulk packed. Size: 7/8".. Hot dip galvanized. Orange painted screw pins. Bulk. Size: 1"Max Load: 8-1/2 ton.. Hot dip galvanized. Orange painted screw pins. Bulk. Size: 1/2"Max Load: 2 ton.. Hot dip galvanized. Orange painted screw pins. Bulk. Size: 1/4"Max Load: 1/2 ton.. Hot dip galvanized. Orange painted screw pins. Bulk. Size: 3/16"Max Load: 1/3 ton.. Hot dip galvanized. Orange painted screw pins. Bulk. 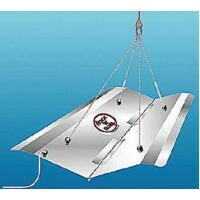 Size: 3/4"Max Load: 4-3/4 ton.. Hot dip galvanized. Orange painted screw pins. Bulk. Size: 3/8"Max Load: 1 ton.. Hot dip galvanized. Orange painted screw pins. Bulk. Size: 5/16"Max Load: 3/4 ton.. Hot dip galvanized. Orange painted screw pins. Bulk. 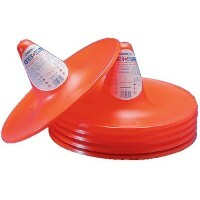 Size: 5/8"Max Load: 3-1/4 ton.. Hot dip galvanized. Orange painted screw pins. Bulk. Size: 7/16"Max Load: 1-1/2 ton.. Hot dip galvanized. Orange painted screw pins. Bulk. Size: 7/8"Max Load: 6-1/2 ton..
A hydrodynamic device designed to scientifically stabilize a moored, anchored or drifting boat. Extr.. Floats the anchor to the surface while the boat is under power. Super tough nylon with corrosion res.. Floats anchors like the AnchorLift but designed specifically for saltwater applications where 10 or ..
Patented hydrodynamic design relies on shape rather than heavy weight, making it more efficient and .. Constructed of high impact plastic. U.V. stabilized, fiber reinforced. 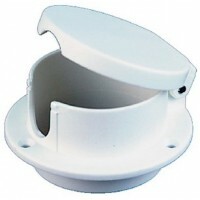 Hinged, snap-down cover. #8 s..
Carded. Uses #8 fasteners. 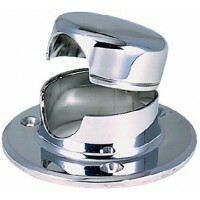 Flange: 3-3/8"Line Size: Up To 1"Material: Chrome Plated Zinc.. Pop display galvinized shackle Contains: 1/2" - 15 Pc. POP Display.. 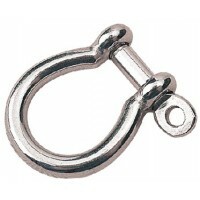 Bow shackle ss 1/2 A: 1/2"B: 1"C: 1-11/16"D: 2-5/16"..
D shackle ss 1/2in A: 7/16"B: 1"C: 1-5/8".. Pop display galvinized shackle Contains: 1/4" - 50 Pc. 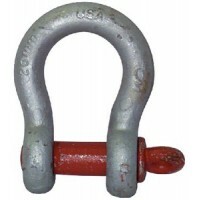 POP Display..
D shackle cast ss 1/4 A: 1/4"B: 1/2"C: 13/16".. Bow shackle ss 1/4 A: 1/4"B: 1/2"C: 13/16"D: 1-1/16"..
D shackle ss 1/4in A: 1/4"B: 1/2"C: 13/16"..
Shackle 1/4in 316 stainless A: 1/4"B: 1/2"C: 13/16D: 1-1/16"..
D shackle cast ss 3/16 A: 3/16"B: 5/16"C: 9/16".. Bow shackle ss 3/16 A: 3/16"B: 5/16"C: 9/16"D: 11/16"..
D shackle ss 3/16in A: 3/16"B: 5/16"C: 9/16"..
Galvinized shackles pop disply Contains: 3/8" - 30 Pc. 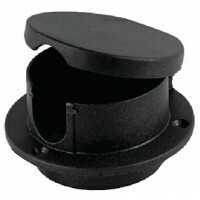 POP Display..
D shackle cast ss 3/8 A: 3/8"B: 13/16"C: 1-3/8".. Bow shackle ss 3/8 A: 3/8"B: 13/16"C: 1-3/8"D: 1-13/16"..
D shackle ss 3/8in A: 3/8"B: 13/16"C: 1-3/8".. 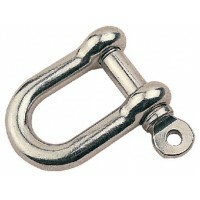 Stainless cast 316 bow shackle A: 3/8"B: 13/16"C: 1-3/8"D: 1-13/16"..
Anchor shackle Contains: 5/16" - 40 Pc. POP Display..